The August 2018 inauguration of the new Rescue Company 2 Firehouse provides much-needed space and enhanced training capabilities for one of New York City’s elite fire rescue teams. Penetron crystalline technology provided technical back-up with durable and waterproof concrete foundation structures for the architecturally-striking project. New Brooklyn training center: The new Rescue Company 2 Firehouse is home to an elite rescue company that responds to emergencies. The concrete basement was waterproofed with PENETRON ADMIX. Recently completed studies and trials confirm that PENETRON ADMIX can add up to 60 years to a concrete structure through its ability to substantially decrease permeability, resist freeze-thaw cycles and chloride migration, and enhance overall durability. 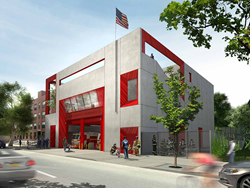 The new Rescue Company 2 Firehouse is home to one of FDNY’s five rescue companies – elite units that respond to emergencies in addition to fires, including building collapses, hazardous materials incidents and water rescue operations. The $32 million construction project in Brownsville (Brooklyn) features many green elements, including a solar water heating system, a green roof and permeable pavement to help mitigate storm water runoff from the site. The 21,000 square-foot facility provides parking for multiple vehicles, plus ample space for tools and workshops, SCUBA equipment, locker rooms, fitness equipment and training areas. Added during the concrete batch mixing process at Advanced Ready-Mix in Brooklyn, PENETRON ADMIX was chosen to waterproof about 600 cubic yards (460 m3) of concrete for the foundation slab and all below-ground structures. “Recently completed studies and trials confirm that PENETRON ADMIX can add up to 60 years to a concrete structure through its ability to substantially decrease permeability, resist freeze-thaw cycles and chloride migration, and enhance overall durability,” explains Christopher Chen, Director of The Penetron Group. 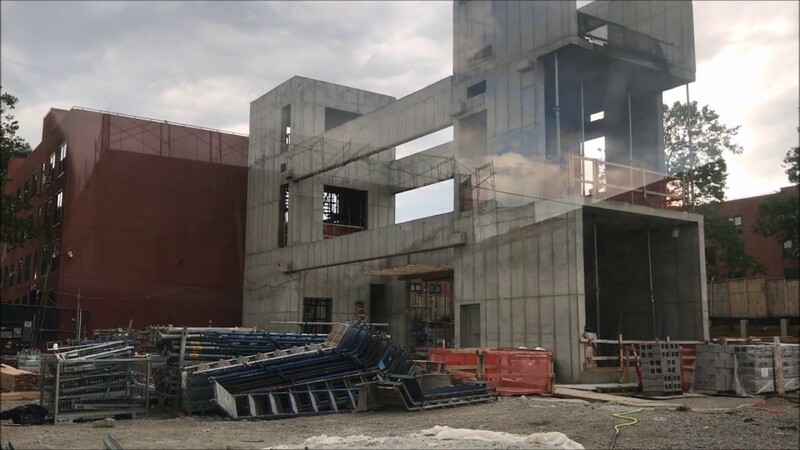 “These results point to an astounding increase in the life cycle of concrete treated with PENETRON; this has far-reaching consequences for the new firehouse and all concrete structures." For more information on Penetron crystalline technology solutions, please visit www(dot)penetron(dot).com, email: CRDept(at)penetron(dot)com or contact our Corporate Relations Department at 631-941-9700. Maximum concrete life cycle: The below-ground structures, treated with PENETRON ADMIX, can last up to 60 years longer due to reduced permeability & resistance to freeze-thaw and chloride migration.